From the most complex tactical game to diceless LARPs, role-playing games are, underneath all the theater, problem-solving games. The ultimate expression of problem-solving is a puzzle, specifically for this article, physical puzzles. Before we get into the puzzles I think would make a great addition to an RPG table, I need to talk about how to use them wisely. Puzzles are something of a double-edged sword. They make for great props on the tables and are likely to get the GM kudos for preparation. That said, some players do not like puzzles. In game physical puzzles like safe cracking resolve through dice rolls and the solution is abstracted from the players. The do not actually have to pick the lock, just roll the dice. This is a test for the player character’s skills. Real world physical puzzles are a test of the player’s abilities. While gamers are a clever lot, spending an entire session fiddling with a puzzle is not role-playing, it is puzzle solving and will kill a session with terminal boredom. Physical puzzles are adjuncts to a role-playing game, not a game unto themselves. I suggest that the physical puzzle is an element of the story, a macguffin. 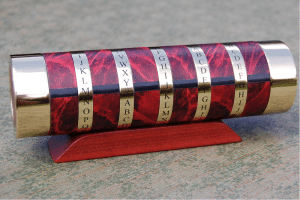 Take the beautiful Cryptex Security Box as an example. Integrating this into an RPG campaign is easy. The PCs steal a box from an evil wizard, but powerful wards seal it. Inside the box is a mysterious macguffin that many powerful interests desire. The Cryptex represents the wards. As the party moves through the campaign and casts spells, steals secrets and gather information, bits of the code reveal themselves. The physical puzzle sets on the RPG table week after week, driving the story forward and when it finally opens after months of gaming, there is real tension around the table. Even better, make the contents the disarm code for a nuclear weapon or its fantasy equivalent. It makes getting the box open that much stressful and glorious in success. I am not saying that a physical puzzle need be the core or a campaign, there are many options for using puzzles as elements of an RPG campaign, specifically cryptography. “Escape Rooms” are quite the fad these days (Gencon has several of them) where people work through various puzzles to escape a room. 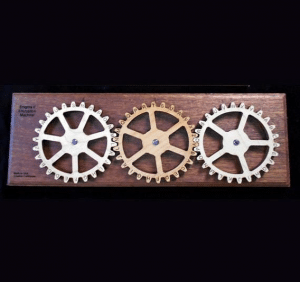 They are so popular that companies sell props specifically for Escape Rooms. Most of them are far too expensive as an RPG prop, but I did find one company Creative Escape Rooms that offers a variety of inexpensive cryptographic props (under $50.00). 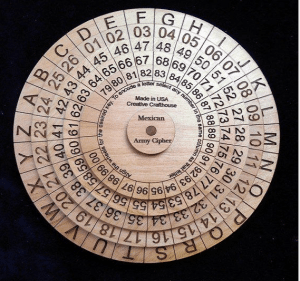 A GM could encode a message using the wheel and make acquiring the key to crack it a mission. Or perhaps the PCs stole the cipher wheel and use it to send covert messages to allies…or false messages to enemies. World War Two provided the impressive “Enigma Machine,” as a method of encryption. One of the key missions during the war was both stealing the machine and stealing a book that listed the setup for each day. If you have both you could intercept messages. While a full Enigma for an RPG tabletop is not feasible (though amazing if you could pull it off), there are simpler versions available. Puzzles add a physical element to the table that is often lacking from RPGs. Let the players touch the puzzle, fidget with it, shake it or otherwise try to discern its secrets. It adds so much to the game and the GM does not have to do anything but let it happen organically. Trust me, the players will love it and the plot benefits are manifold. This is just a tiny sample of great physical puzzles you can add to any tabletop RPG game. If you have any other suggestions, leave it in the comments.